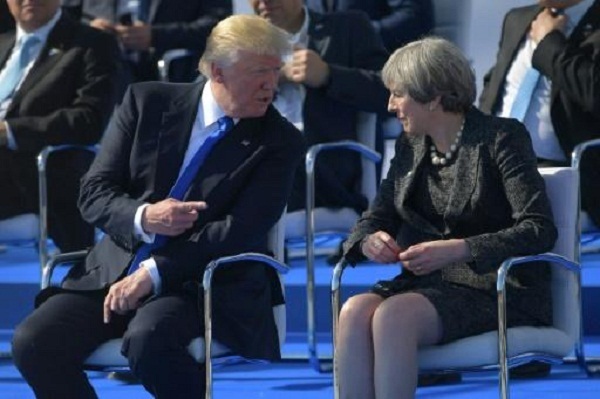 WASHINGTON - British Prime Minister Theresa May has insisted a long-awaited state visit by Donald Trump will go ahead as planned despite a diplomatic spat triggered by the US president's comments after a terror attack in London. Speaking to ABC News from Downing Street in an interview that aired Sunday, she added that London was in talks with internet giants Google and Facebook about "doing more" to assist authorities in tracking extremists using the web to plan attacks, an issue she said she would take up at the UN General Assembly next week. After an explosion in the London subway early Friday injured more than 20 people, Trump on Twitter blamed "sick and demented people who were in the sights of Scotland Yard." Britons expressed outrage at the president's suggestion that British authorities had advance knowledge about the attackers. May herself told journalists Friday that "I never think it's helpful for anybody to speculate on what is an ongoing investigation." "Her Majesty the Queen issued the invitation," she said. "The president has accepted it. It's just a question of getting dates to -- and sorting out the logistics." May said the point of the historic "special relationship" between the two countries was that "when we do disagree we're able to say so -- and pretty bluntly." As an example, she cited the sharp differences over the Paris climate change agreement. "I've made very clear I was dismayed when America decided to pull out of that," she said, adding that she hoped the US administration would be "able to find a way for America to come back into the agreement." She said British authorities were working with internet giants like Facebook and Google "about doing more."